Endow Maryland provides an incentive for Marylanders to give back to their local communities in a meaningful and lasting way. The Endow Maryland tax credit applies only to gifts of permanent, endowed funds. Please click here for general information or check out these Frequently Asked Questions. The Endow Maryland Tax Credit for 2019 allows Washington County residents to claim a 25% state tax credit when they create or contribute to an unrestricted community endowment fund, field of interest, designated fund or scholarship at the Community Foundation of Washington County MD. Donors must contribute at least $500 to a community endowment fund or a minimum of $5,000 to create their own named endowment to support one of six areas of interest: arts and culture, historical preservation, health, education, self-sufficiency and youth/recreation or a specific nonprofit organization in Washington County, Maryland. 1. Please call Stacey Crawford, president/CEO at (301) 745-5210 to discuss your fund and contribution options. 2. Complete the required Endow Maryland Commitment Form. 3. Complete the required Endow Maryland Waiver of Informality Form. 4. 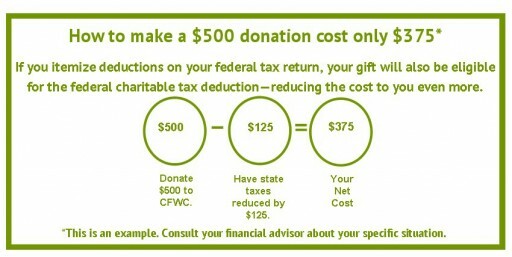 Return both forms to the Community Foundation by e-mail at staceyc@cfwcmd.org, stopping by our office or mailing them to 37 S. Potomac Street, Hagerstown, MD 21740.